Are you ready for an embarrassingly easy recipe? While still being the most delicious meal of the summer??? I am honestly not even sure you can really consider this a recipe, but regardless, I am SO EXCITED to tell you about these pancakes. 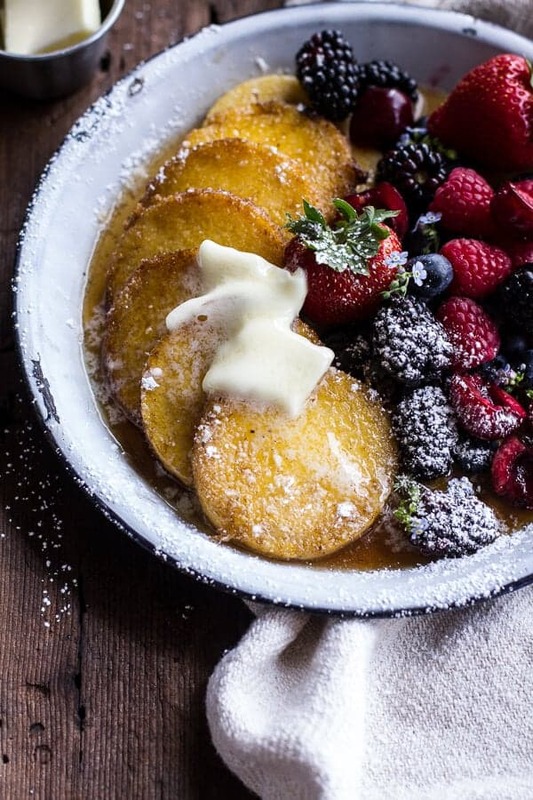 I have been waiting weeks to talk all about these, so I am giving you fair warning that I might babble on about polenta, butter and combining them into the best breakfast ever. Did I mention, my love for polenta and butter? Let me just start out by saying that if you do not like butter or buttery things (is that possible), than these pancakes are not for you. 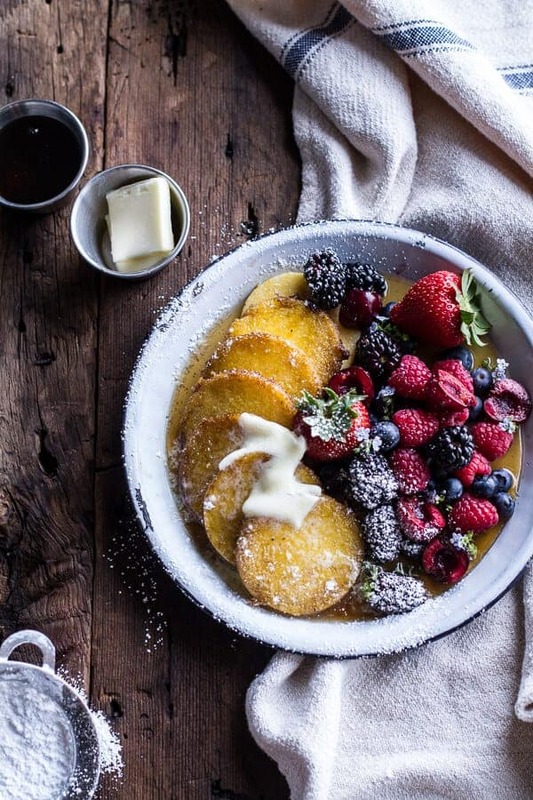 Some pancakes are all about the berries, or the chocolate or maybe something even fancier that I simply cannot think of right now because my mind is having a buttered polenta moment. 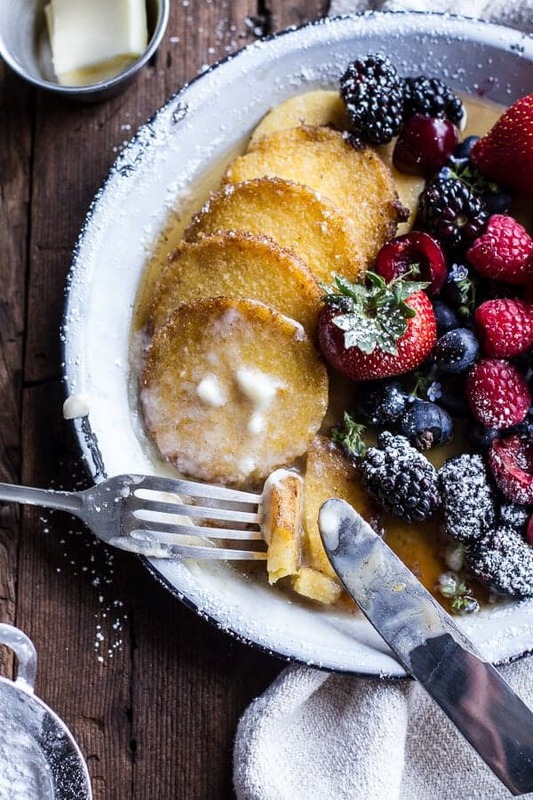 With these pancakes, it’s all about the butter. You just cannot make these with anything else. Not olive oil, not coconut oil and not any of those weird buttery spreads. I am talking real deal, BUTTER. I used that fancy organic Irish butter and it was worth the extra cash. 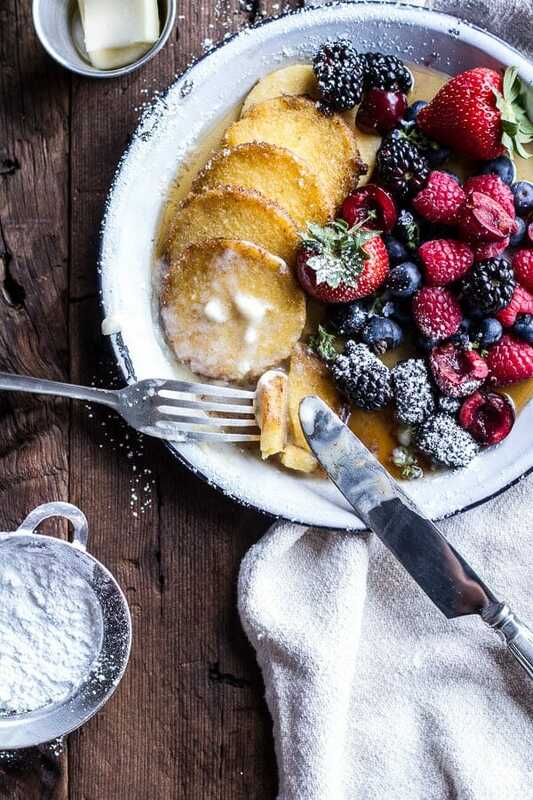 You need the good stuff for these pancakes. 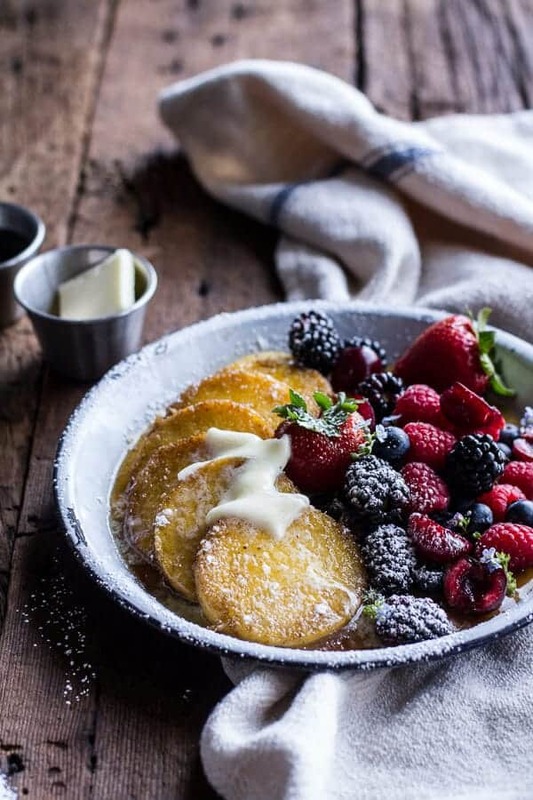 The idea for these pancakes actually came from a reader who commented on my Parmesan Grilled Polenta Chips. 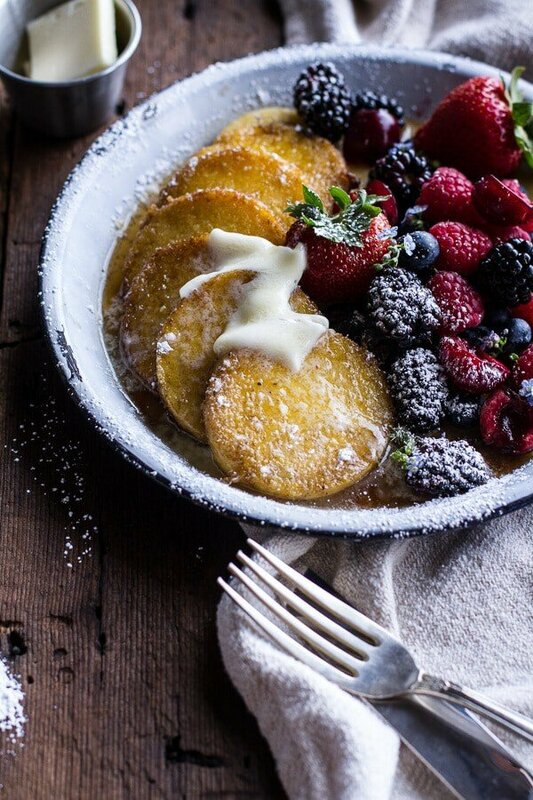 She had said they she fries polenta on the stove, but instead of a savory polenta she makes it sweet with fruit and powdered sugar. She called it Cornmeal Mush. I think it may be a southern thing, but I knew I had to try my hand at a sweet polenta. Originally, I actually tried making real polenta pancakes. Meaning I tried to use eggs, milk and all the typical pancake stuff. The pancakes turned out great, but they just tasted like cornbread pancakes and they really were not what I was going for. So that is when I decided I was going to keep things very simple. 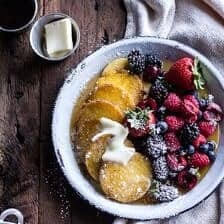 Just polenta, butter, powdered sugar, real maple syrup with lots of berries. It may sound like nothing special, but you guys, this is my favorite breakfast of the summer. 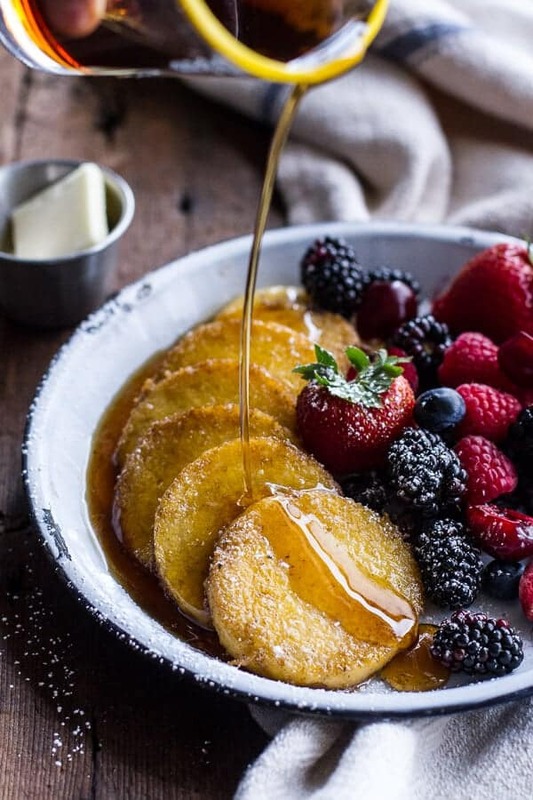 At first I was kind of nervous about just telling you guys how to cook some polenta with some butter, then sprinkle on the powdered sugar + a drizzle of maple syrup and then add a side of berries, but they just get me t0o excited not to share them. Is it weird that food can get me this excited?? Aside from rice, polenta is the grain I use most. I personally like it more than rice (I still love you though, rice), but rice just goes with everything and everyone in my family will eat it, so rice gets made a little more often. Polenta is something I turned my parents on to years back when I first started cooking for the family. It’s a side I make with all my cozy winter meals, but somehow gets a bit neglected in the summer. Well, apparently I wanted to change that, because this summer I am just as polenta crazy as I am mid winter. So these pancakes? They really are just sliced polenta rounds that get pan-fried in a skillet full of butter. They take five minutes (tops) to make, and they’re actually a completely well-balanced and healthy breakfast, lunch of dinner. Yes, you can totally make these at any given time of the day. Plus, breakfast for dinner is always one of my favorites. Especially, when they are sweet like these are. I did make my own polenta, and also added some fresh corn to the mix because I seem to be adding corn to everything these days. It’s just so good right now. For this recipe, I am telling you to use pre-made polenta that comes in a tube though. I really wanted to keep this recipe quick and simple and using the pre-made stuff is just plain easy and it really tastes pretty close to the homemade stuff. Although, I did love that my polenta had some fresh corn in it . If you are interested, I gave you the instructions at the bottom of the recipe. Really, you can do whatever your time allows. 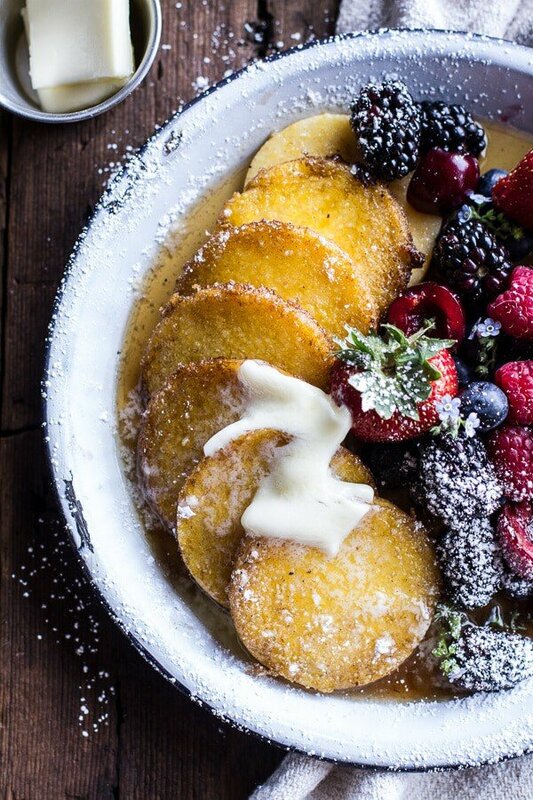 Once you’ve got the polenta hot and buttered, it’s time to plate the cakes and sprinkle on the good stuff. I went for the double combo of real maple syrup (use the good stuff!!) and powdered sugar. It’s may seem a little sweet, but just like the butter these are a must. 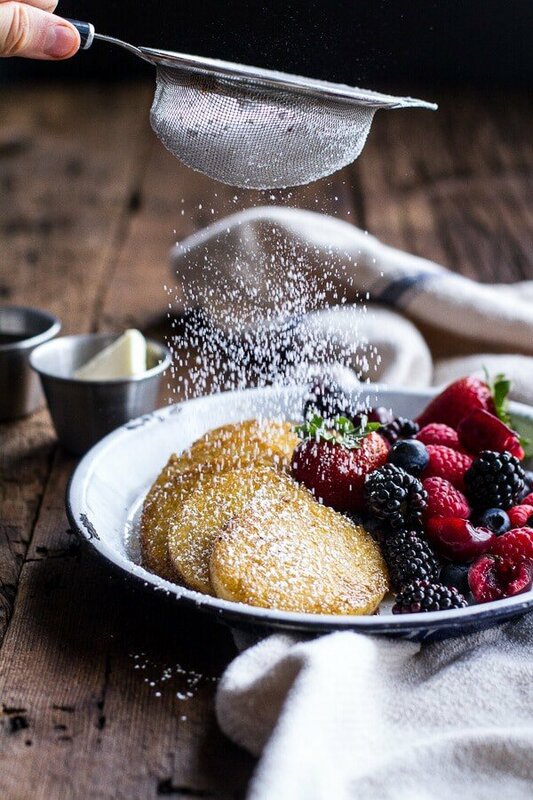 I guess if you really wanted you could choose between maple and powdered sugar, but that’s just not as fun and hey, it’s Friday, the start of the weekend, meaning – let’s have some fun! Of course, I also consider maple syrup a health food. 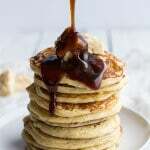 Don’t you guys just love how I consider things like chocolate, cheese and maple syrup – health foods? Yeah, my mom taught me well. 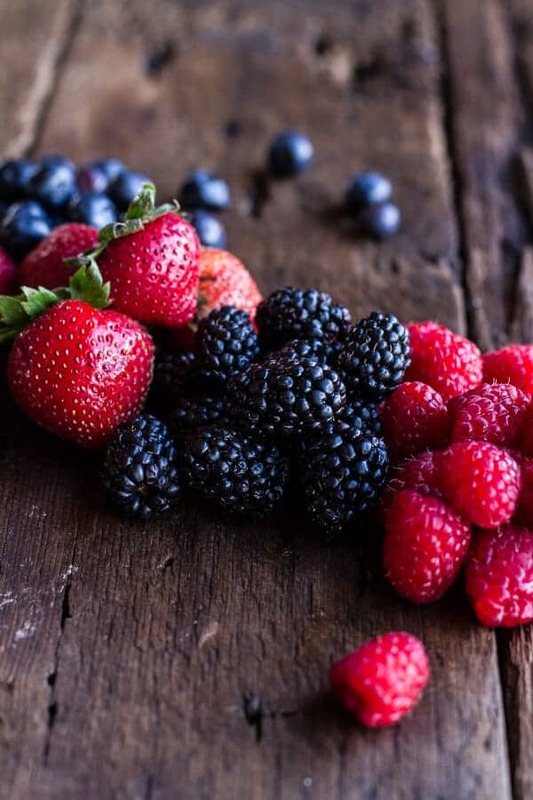 Then all you need to finish these off is a side of fresh summer berries. That’s it. Just five ingredients, almost zero time and the best breakfast (lunch or dinner) ever. Lastly, sorry to my mom, whose favorite food is probably buttered polenta and whose favorite meal is most definitely breakfast. She never even got to try these, but had to stare at the photos and tell me what she thought. She had to listen to me from 1500 miles away, while I told her about how delicious these were. I am so sorry. Promise to make them again…and again! Slice your polenta in 1/4 inch-1/2 inch rounds. Heat a skillet over medium heat, once hot add a pat of butter. Add half the polenta rounds (or however many can fit in one layer), cook for 2 minutes per side or until lightly golden and crisp on the edges. Remove from the pan, place on a plate. Repeat with the remaining polenta. 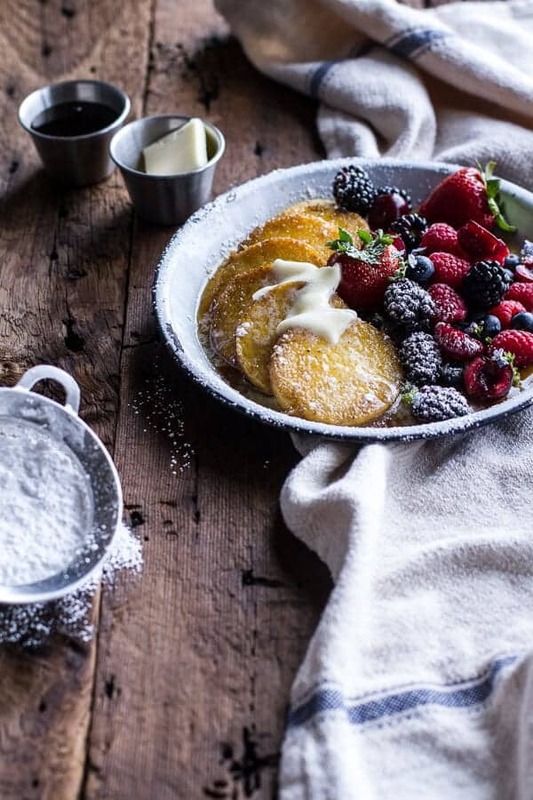 To serve divide the hot polenta pancakes among plates. 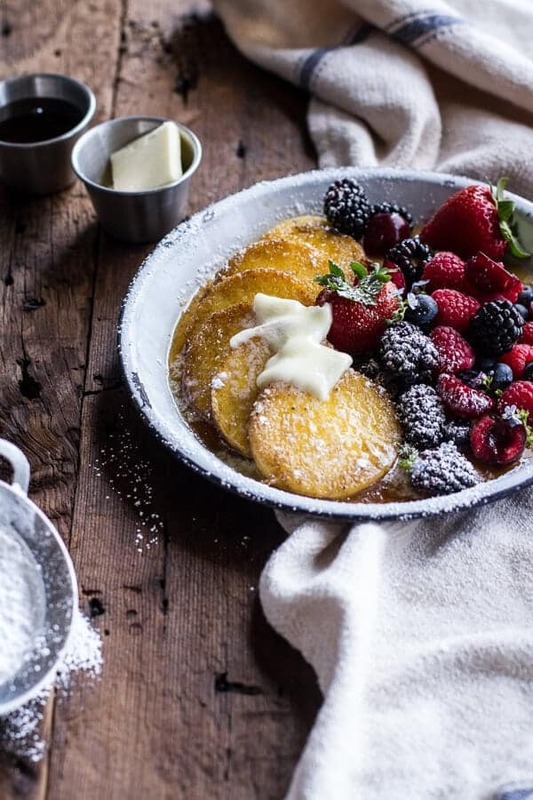 Add some fresh fruit to each plate. 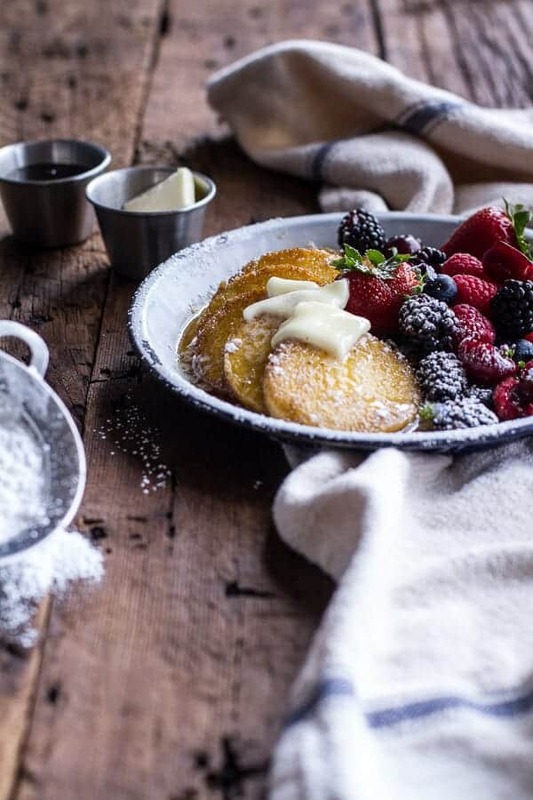 Sprinkle the pancakes with powdered sugar and a generous amount of maple syrup. Add a pat (or two) of softened butter and watch it melt all over those pancakes. Eat. Right. Away. *If you cannot find polenta in a tube I make my own all the time. Bring 4 cups of water to a boil in medium size pot. Once the water is boiling, gradually whisk in the 1 cup of polenta . Stir in 1 cup of fresh corn kernels. Reduce the heat to low and cook until the mixture thickens, stirring often, about 10 to 12 minutes. Turn off the heat. I add two tablespoons of butter, but you do not have to. Line a 9x13 inch baking dish with parchment paper. Transfer the polenta to the baking dish, spreading evenly into one layer. Refrigerate until firm, about 2 to 3 hours or overnight. Use a cookie cutter to cut the polenta into circles or just cut the polenta into squares. You may want to halve your polenta rounds if they seem too thick. You want them between 1/4 inch to 1/2 inch thick. Cook as directed above. Because really, look at them. I just can’t even explain how much I love these! Who cares if this is easy? I would not have thought of it, and it looks simply divine. And also, I live in England so it is easy to get the fancy Irish butter (which yes, I got all the time when I was living in America). So I buy fancy French instead!! i want to live in england. everything seems so awesome over there!! i need to at least visit at some point in my life! It is awesome here, so you do need to come visit sometime! I am always wary about posting things that I don’t consider ” a recipe” but I am SO glad you posted these. I still haven’t tried Polenta, because I fail at life. 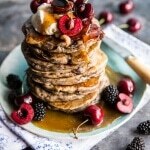 BUT…pancakes are sort of my THANG, so methinks I should just dive in face first! Plus all the butter? I’m in. Pinned! i am the same way, but i think i need to get over it. how have you never had polenta?? you have to try it with dinner sometime. just the classic way first. so good! thank you for pinning! PS you crepe cake?? amazing!! pinned it of course! I used to eat this frequently when I was a kid, (my mom always called it fried cornmeal mush …not so appetizing) but I should make it again soon! I’ve never dreamt that polenta could be used in a sweet application! I’m drooling! corn + butter = heaven. And berries. OMG. This is summer right here. 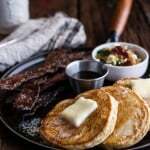 While I don’t like the heat summer brings, I do love the recipes! 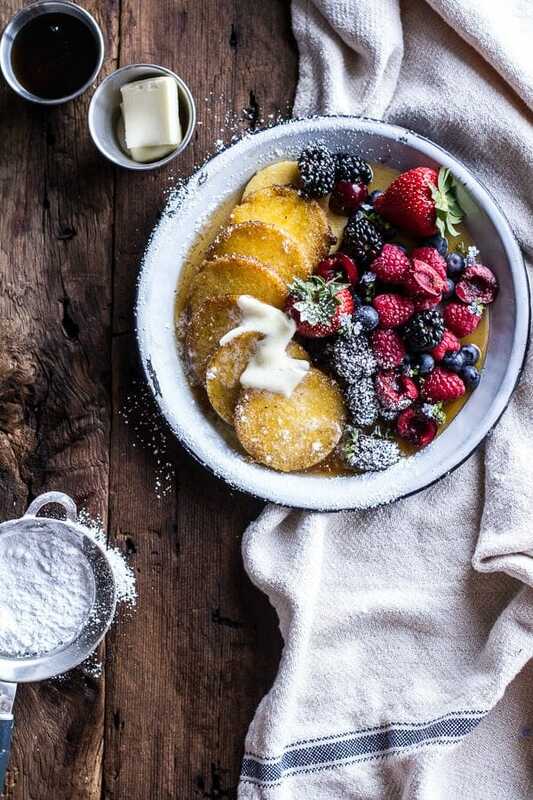 Gorgeously captured as well 🙂 Must pick up some polenta ASAP! I have a tube of polenta so you know what that means! YUM! Glad you posted this non-recipe still totally a recipe recipe. Have a good weekend! yay!! i so hope you love these! have a great weekend! Wait, there’s people in the world who don’t like butter or buttery things??? I’m certainly not one of them!! These look delicious, and I love that it is easy! Sometimes that is just what you need!! I know, crazy thought! Thanks Cate! This looks amazing! I can never fry my polenta without it falling apart though! Can’t wait to try this! Thanks Kathy!! The tube polenta holds up really well! What a fab idea T! Your photos are incredibly gorgeous! Super lovely. And I love the simple! I definitely need to try these! I LOVE polenta! Oh man, you would love this then! Have a great weekend! I like how you made polenta sweet instead of savory, I also love polenta with my eggs in the morning! Bring on the buttah! LOVE these! So pretty! And I wish I could have a taste right now! Thank you so much, Rachel! Have a great weekend! ok this is genius. i freaking love those tubes of polenta, but i’ve always only used them for savory things! it never occurred to me to use them in a sweet dish. awesome, girl!! thanks! have a fun weekend!! Um, WHO DOES NOT like butter/buttery things? Those people can give me their portion of polenta pancakes. With extra butter. i know right?!? Butter is rules. Hi I’m the cornmeal mush person–LOL. Yes I fry it and put powered sugar on it and syrup–don’t forget the syrup. We also eat this with eggs and Geotta. Here in the Cincinnati area we have Geotta festivals. Also try making Cincinnati Greek chili–your brothers will like. thank you!! seriously, i love this recipe so much and it’s all because of you!! do you live in cincinnati? i am from cleveland (lived there till i was 15, but visit often since all of my extended family still lives there) and cincinnati chili is my all time favorite! Yes I have lived in Northern Kentucky all my life. I haven’t made it to Cleveland but I do like Cedar Point. Thanks for sharing all those great recipes and stories. thank you! they have become a staple here! 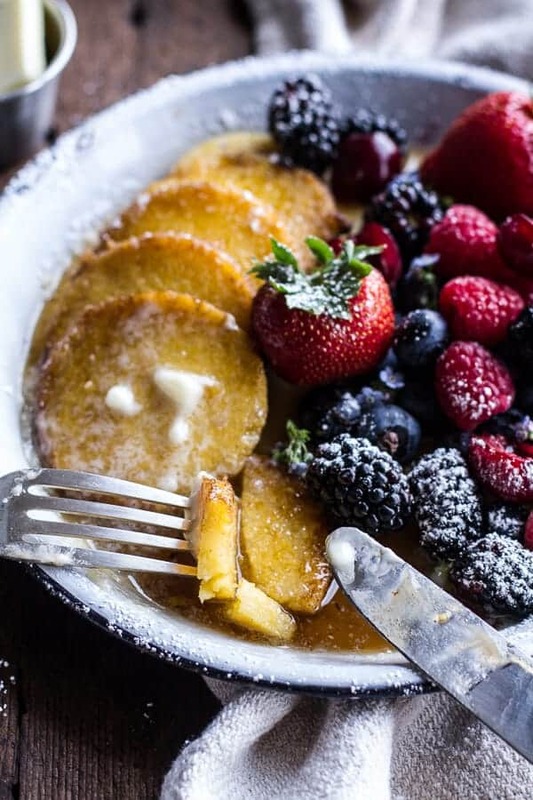 Oh wow, I always have leftover polenta and never know what to do with it….never thought of going sweet! Thanks for the inspiration! Polenta = my heart. But I usually go in the savory directions LOVE that these are sweet!!! thanks nicole! You have to try it done sweet, so good! I LOVE polenta and make it often. I almost always use the leftovers to fry for breakfast but never thought of putting syrup on it. You’re a mad genius. haha! thank you so much! have a great weekend! This is the best use of polenta I have ever seen! Girl this sounds so delicious!!! Pure summer perfection Tiegs!! I’ve always gone the savory route with polenta too. I love this sweet twist! I love polenta! I switched to polenta when I gave up pasta for a month. It helped me give up my pasta addiction. Only now I have a polenta addiction:) LOL! I love the texture of these cakes and can’t wait to make them for my kids! It’s so versatile! Thanks for the recipe!!!! Girl, I am with you on the polenta train – it’s so good! I love the rounds too – so much easier and prettay. Hello dear, I can’t find your polenta recipe! Because I can’t find the one that comes in a tube I figured I’d make it at home. I could swear I saw the polenta batter on here before. Help! I make my own polenta, and roll it. 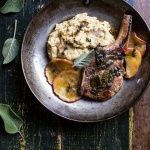 I’ll give this a try, I love polenta! and this looks delicious. Try to find organic polenta or use organic dry polenta to make your own as the writer describes about. Nearly all non organic corn products in the US are made with Monsanto round up GMO corn. This looks amazing! Now if only I could get someone to bring it to me in bed! Ha! If you like polenta, try scrapple. It is traditional breakfast from my Louisiana (German) childhood. We sliced it, fried it, and served it with butter and cane syrup for breakfast. Ooo sounds so yummy and something I would definitely love to try! Thank you for the suggestion Linda! Hi. Your recipe sounds really good. I am wondering if you’ve ever made it with oil instead of butter. I am allergic to dairy. Wondering if sauted in oil instead of butter would work/taste good.